As the business of electronics recovery becomes increasingly international, one challenge for the industry is making sure the developing world has a voice in the conversation. An ongoing workshop series helps make that happen. The E-Waste Academy Managers Edition (EWAM) is a global forum for stakeholders involved in the practical design and implementation of WEEE and e-scrap management solutions. It offers a platform to exchange best practices, discuss existing challenges among practitioners and support more informed decision-making. 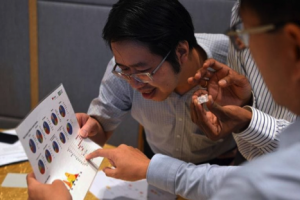 The latest action from the project took place in early May of this year in Bangkok, where policymakers, government officials and representatives of WEEE recycling enterprises came together for a five-day intensive workshop specifically focusing on the Asian region. The EWAM participants came from 11 countries from South and Southeast Asia, representing a diverse mix of e-waste management systems and approaches. The workshop was carried out by the UNU Sustainable Cycles Programme, which is hosted by the UNU Vice Rectorate in Europe, and was held in partnership with German economic development consultancy GIZ. The main sponsor was the German Federal Ministry for Economic Development and Cooperation, with additional sponsorship coming from World Resources Forum and Sustainable Electronics Recycling International. In some countries e-waste policies are in place and are moving toward implementation. Others are still looking to either ratify legislative drafts or develop their own e-waste take-back systems. All countries face the challenge of addressing and improving informal end-of-life electronics collection and recycling activities, which can lead to major health and environmental impacts for informal workers and local populations. The diverse experiences among EWAM participants on these issues led to interesting discussions on ways to address the e-waste challenge and set up effective systems. Basic foundations and principles of e-waste, policy management and legislation. Compliance and enforcement (regulatory approaches to enforcement of national and international legislation, including transboundary shipments and integrating the informal sector). Treatment and identification steps of critical/hazardous and common fractions obtained from e-waste, such as plastics, CRTs or printed circuit boards, as well as business models for dealing with these. Of course, environmentally compliant e-waste recycling is only profitable for some higher value electronic and electrical devices, leading in most cases for additional financing needs. Many governments have established some form of extended producer responsibility legislation or structure of fees to help ensure the economic sustainability of electronics recovery. To learn how some producers have proactively addressed their environmental impact and are pursuing circular business models, the group visited the FujiXerox Eco-Manufacturing facility (FXEM), Thailand. Here, the participants learned how old copiers and printers are dismantled. Some of the components were cleaned and then used for spare parts, some items were refurbished, and other material was sent for recycling. After getting the basics on the system, participants got some hands-on experience, dismantling e-waste on their own at the FukiXerox site. The next day, another workshop showed participants how to identify and separate different plastic fractions. On the last day of EWAM, participants heard from producers and other stakeholders the details on pilot projects and next steps taking place at the national and regional level in various jurisdictions. Panelists included both government and private-sector leaders, with representatives from the Fuji Xerox (Japan), Panasonic (Singapore), the Reverse Logistics Group (Germany), Thailand’s Pollution Control Department and Thailand’s Waste Management Association. Participants in the EWAM event are now well-prepared to develop e-waste management systems further in their own countries while also improving their business operations. Further, they have a richer connection of international colleagues, a fact that can inspire trading of best practices down the road. We thank all our experts and participants for joining the workshop and brining great enthusiasm to the gathering. Extra gratitude goes to Fuji Xerox for a great site visit.